You knew I was going to start the new year off with a delicious and healthful dish! 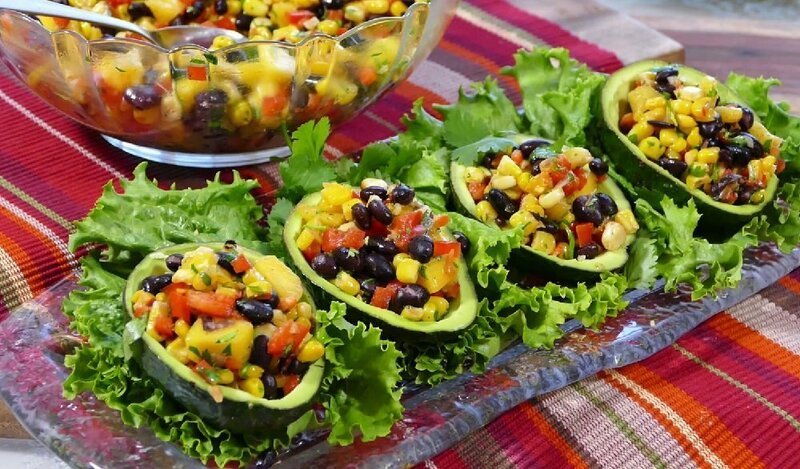 But, what’s really great about this awesome avocado recipe is that it was the grand prize winner in a cooking contest this year! That’s right, 11-year-old Scottsdale resident Katie Cafferelli won the top prize for her recipe, Totally Ave-Some. It incorporates skillet-toasted corn sautéed in shallots and garlic, then tossed with black beans, red bell pepper, mango, avocado and spices. The mixture is then spooned into the avocado shells and topped with cheese. It’s the perfect dish for a party, appetizer or lunch! Totally Ave-Some took top honors in a contest sponsored by Blue Cross Blue Shield of Arizona as part of their 2017 Walk On! Kids Cooking Challenge. In an effort to inspire kids to make better choices, BCBSAZ invited kids ages 9-12 in Arizona to submit ideas for healthy dishes. All recipes had to be original, include at least one fruit or vegetable and be able to be prepared in 20 minutes or less. Katie’s recipe had it all, with its bright and colorful presentation to its nutritious and tasty combination of ingredients loaded with vitamins and antioxidants. Congrats, Katie! Your recipe is Totally Ave-Some. Way to get us off to a great start in 2018! For more information about Walk On! visit www.walkonaz.com. Watch my How To video for Katie’s dish here!